A bit of this and a bit of that. 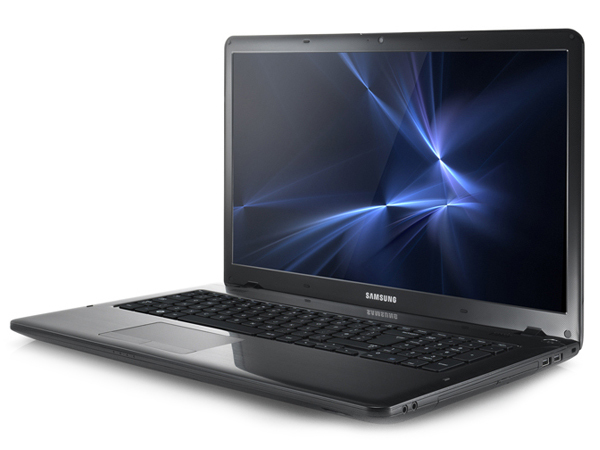 Samsung's 355E5C brings along an APU and a Radeon HD 7470M GPU from AMD alongside a matte screen. Sounds like the perfect office laptop. Our review reveals whether that is true. The market for entry-level laptops is swamped with innumerable models from various manufacturers. Samsung adds yet another device with its 355E5C-S02DE. AMD's E2-1800 APU powers the device and Samsung installs a dedicated AMD Radeon HD 7470M GPU to support it - a rather unusual combination. Our review uncovers whether Samsung can stand out from the masses with its 355E5C owing to the APU / GPU combination. 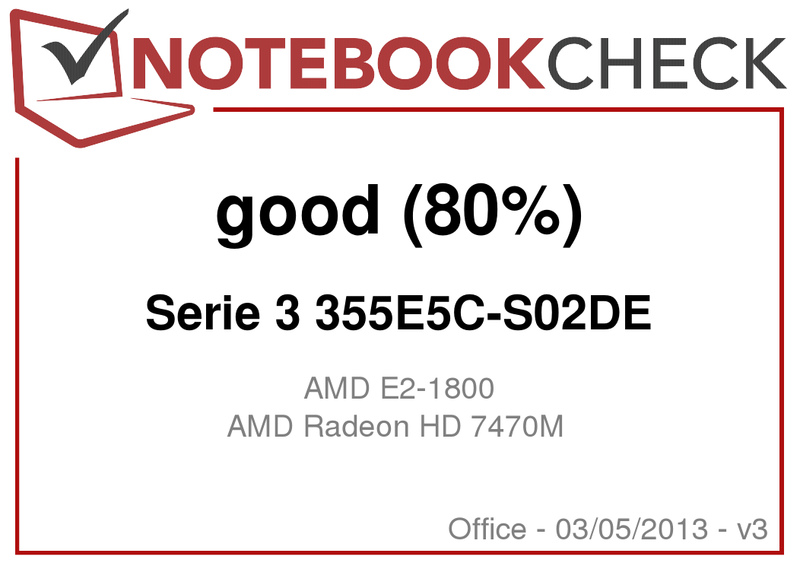 We used Lenovo's B575e (AMD E2-1800, AMD Radeon HD 7340) and Asus' F55A (Intel Pentium B980, Intel HD Graphics) to classify the laptop. Samsung stuffs the 355E5C's entire technology in a black plastic casing. The laptop has both the design language and color in common with the recently reviewed 17.3-inch Samsung 355E7C-S05DE laptop. 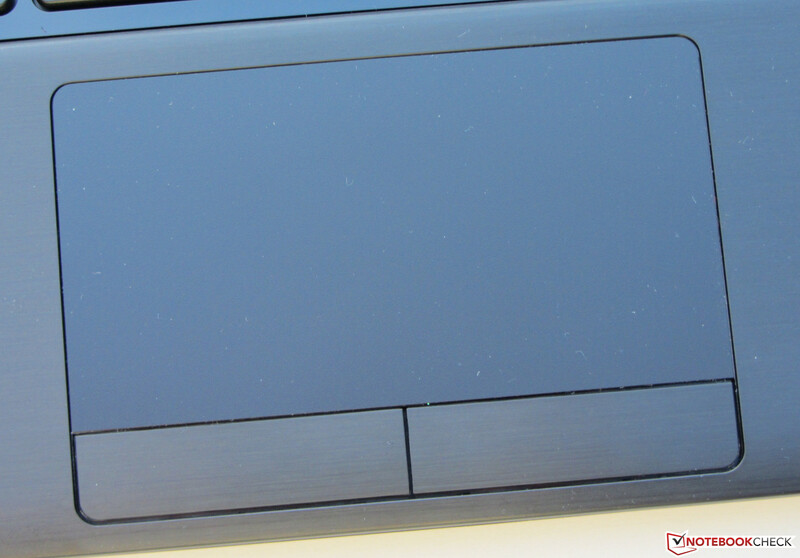 The base unit's top and the lid's back feature matte, brushed metal looks. The display bezel and the keyboard rim are made of glossy plastic. Both the casing of Lenovo's laptop and the F55A are also one hundred percent plastic. In terms of stability, the 355E5C's casing is identical to its bigger brother. 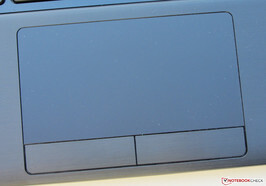 The base unit can be easily dented underneath and left of the touchpad, as well as on the keyboard's left. 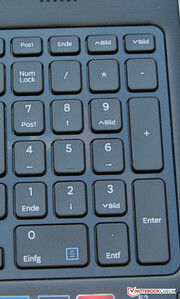 Like the 355E7C, the base unit's front right corner lifts from the surface as soon as pressure is applied to the frame left of the keyboard. The base unit and lid could also be stiffer. The lid's back proves to be more rigid than in the 355E7C. It can only be pressed to such an extent that minor image distortions occur in a few places. The hinges keep the lid firmly in place but rock a bit. It is not possible to open the lid with one hand. 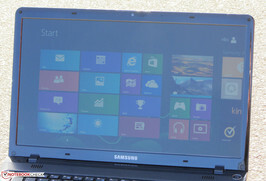 Samsung's laptop sports today's standard interfaces and thus equals both contenders. There are differences in the number of USB ports in the three devices. Samsung installs four, Lenovo builds in three and Asus two. All three laptops feature at least one USB 3.0 port. 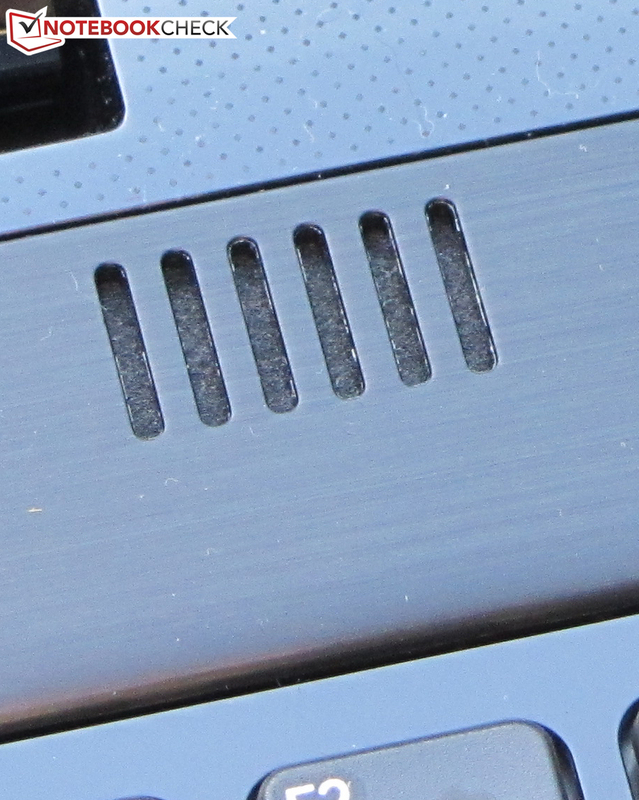 Some ports on the 355E5C are positioned unfavorably and are mostly located in the front area on both sides. 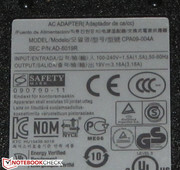 The AR9485WB-EG Wi-Fi module used in the 355E5C comes from Atheros. It supports the 802.11 b/g/n standard. Reception was no problem regardless if we were in the router's immediate vicinity (approx. 3 meters/~10 feet) or two floors below the router. Windows' Wi-Fi indicator always displayed four to five bars. The Bluetooth 4.0 chip also comes from Atheros. Like in innumerable laptops, the Gigabit Ethernet chip is a member of Realtek's RTL8168/8111 family. The installed 1.3 megapixel webcam makes pale and noisy pictures with a resolution of up to 1280x1024. Samsung does not add any exciting accessories in the box. A leaflet with warranty information, a quick start poster and a quick guide about Samsung's preinstalled apps is found. 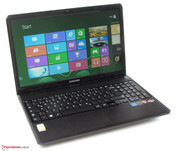 Toshiba delivers the 355E5C with preinstalled Windows 8 64-bit. A Windows DVD is not included. The usual Windows 8 recovery system exists to get the operating system running again in case of malfunction. The F11 key has to be pressed during the booting process to open it. A tip: Users who want to get rid of the preinstalled Samsung tools should reset the entire system to state of delivery. The necessary drivers and wanted programs (e.g. 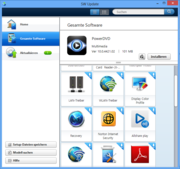 PowerDVD) can be reinstalled using the preinstalled SW Update tool even after resetting. 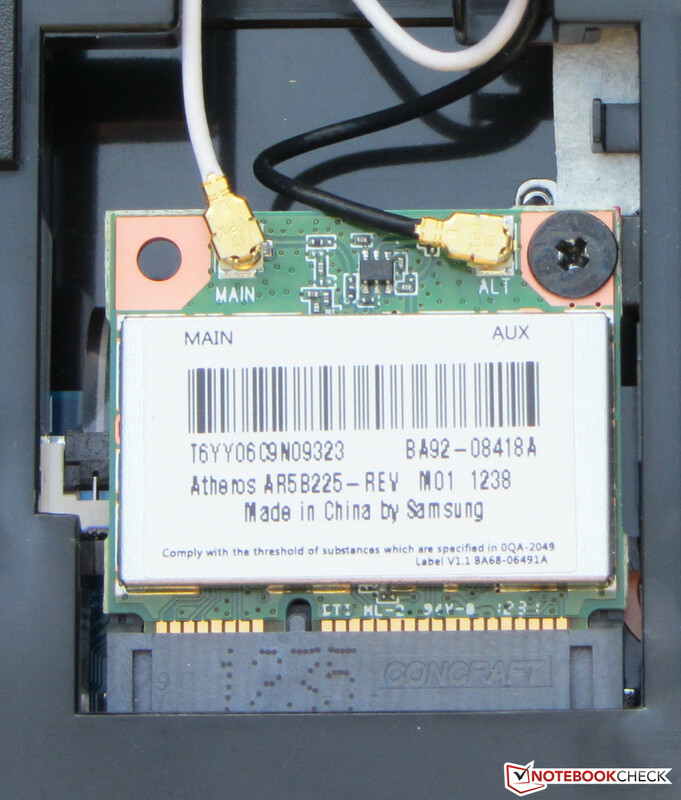 The two maintenance covers of the 355E5C allow accessing the Wi-Fi module, hard drive and working memory. It is not possible to access the fan. Two working memory banks are present. One is furnished with a 4 GB module. 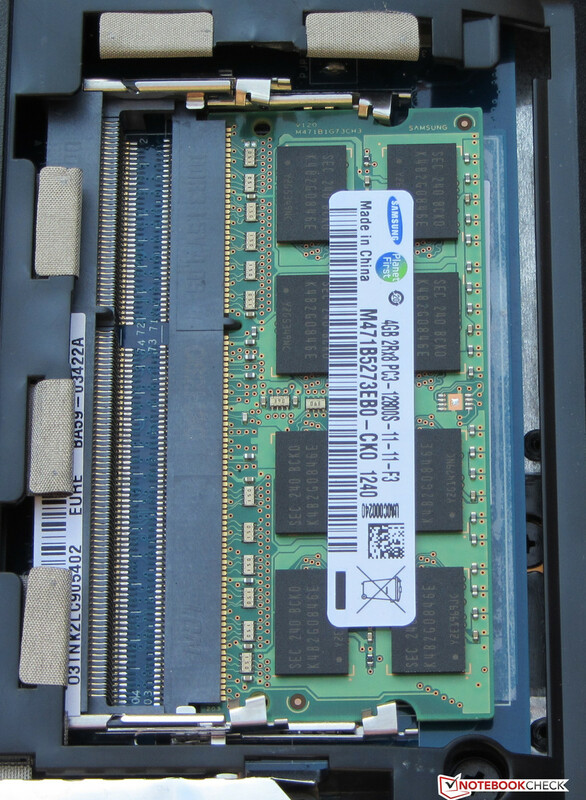 The laptop supports a total working memory of up to 8 GB (manufacturer's specs). A second 4 GB module currently costs around 20 Euros (~$26) to 25 Euros (~$33). However, the working memory does not run in dual-channel mode even with a second RAM module. The E2-1800 APU's memory controller only supports single-channel mode. The hard drive can be pulled out easily since it is not fastened with additional screws. The 355E5C comes with a 24-month warranty. Buyers of the F55A and B575e have to be content with a 12-month warranty. 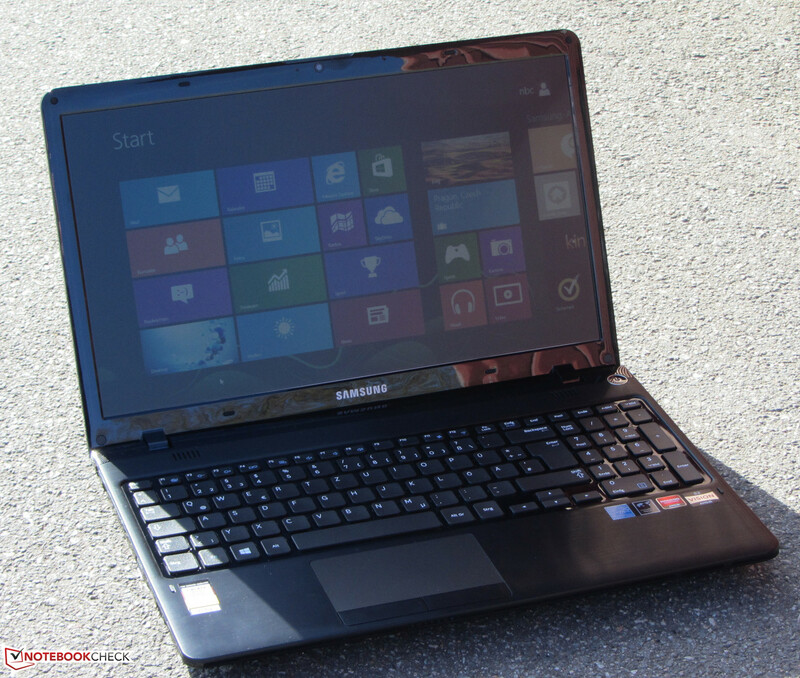 The warranty period of Samsung's laptop can be upgraded. A 36-month warranty costs around 65 Euros (~$85) and a 48-month warranty adds approximately 100 Euros (~$131). 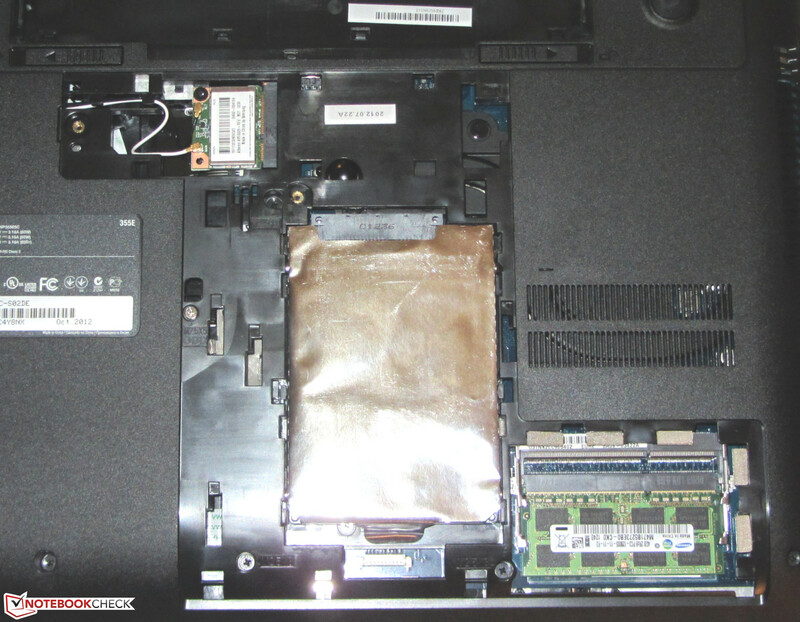 The warranty upgrades have to be purchased and activated within the first 90 days after buying the laptop. 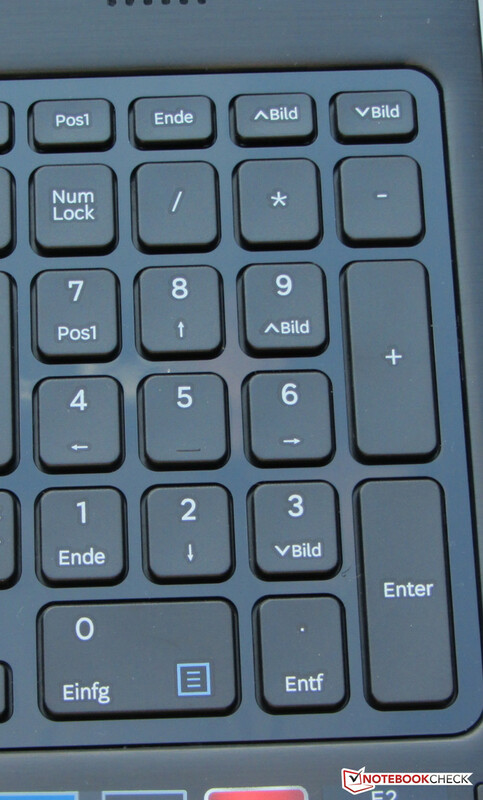 The unlit chiclet keyboard in the 355E5C includes a number pad. The keys feature a medium drop and sufficient resistance. It is no problem to detect the pressure point. The keyboard only yields slightly while typing. Samsung principally installs a satisfactory keyboard, although it cannot compete against the better typing qualities of Lenovo's keyboard. 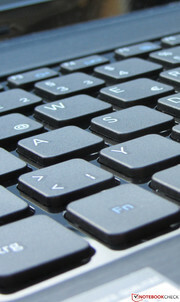 A multi-touchpad is used as the mouse replacement. With a size of 10.2 x 5.5 cm (~4 x 2.2 inches), it provides enough room for gestures. The sleek surface allows the finger to glide easily. The single multi-touch gestures can be turned on and off in the setup menu. Both mouse keys feature a short drop and a clearly audible and palpable pressure point. Samsung installs a matte 15.6-inch screen in the 355E5C. 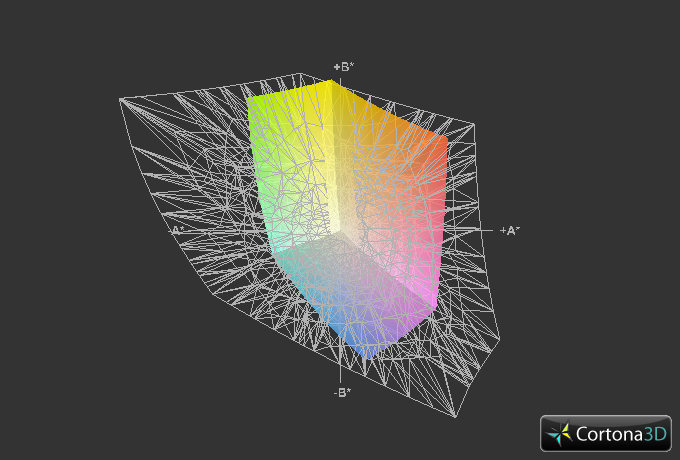 The screen's native resolution is 1366x768 pixels. Other screen models are not available. 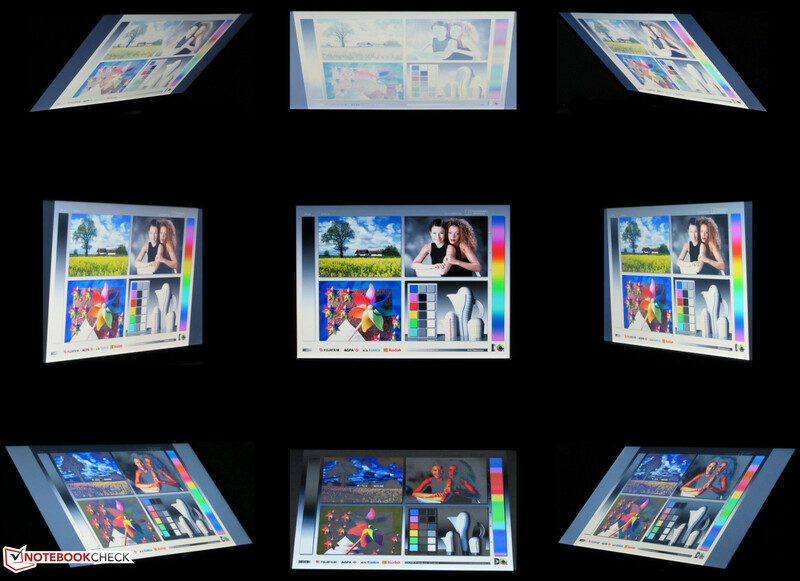 The screen's average brightness of 226 cd/m² is within an acceptable range. The screen used in the F55A is a bit brighter with 239.8 cd/m² and that of the B575e is behind both contenders with 216.8 cd/m². Both the contrast of 400:1 and black value of 0.59 cd/m² is more than acceptable for a laptop of this price range. 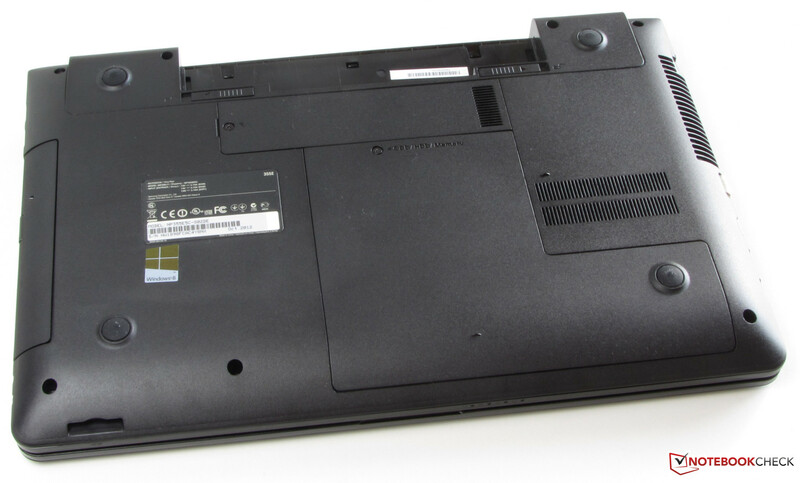 The screens in the F55A (241:1; 1.08 cd/m²) and in Lenovo's laptop (277:1; 0.84 cd/m²) offer poorer rates. 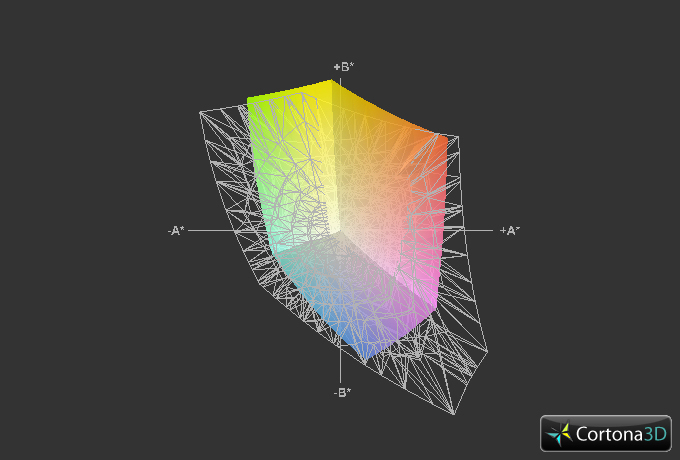 The 355E5C's screen can neither reproduce the AdobeRGB nor sRGB color space. We measured the screen in state of delivery (target color space: sRGB) and ascertained a clear DeltaE 2000 deviation in blue, cyan, magenta and the gray scales. Like in many laptops with a simple TN screen, there is an intense blue cast. The screen's brightness is sufficient for outdoor use. The content remains legible even in bright sunlight. 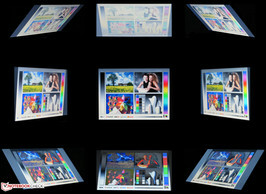 Reflections are also prevented due to the matte surface. Like in most low-budget laptops, changing the screen's vertical viewing angle quickly causes picture distortions. The horizontal viewing angle is more generous. The content can still be recognized even when looking from the sides. However, the picture dims a bit. The hardware of the 355E5C provides enough power to cope with everyday tasks. Internet communication, word processing, Internet browsing and rendering videos are no challenge for the laptop. Even Full HD videos can be played. The video decoder in AMD's GPU (AMD UVD3 decoder) does the main work during playback. We tested rendering HD material (1920x1080 pixels, H.264 coding) using the DXVA Checker tool and recorded an average CPU capacity of 13 percent. The 355E5C is currently available for a price between 390 Euros (~$510) and 500 Euros (~$654). Also, a second configuration features a 500 GB hard drive. The other equipment and the price level are identical. AMD's E2-1800 APU powers the 355E5C. The CPU part of the APU consists of a dual-core processor which clocks with 1.7 GHz. It does not feature Turbo. The main processor calculated the Cinebench test with its full clock of 1.7 GHz. The results were as expected. 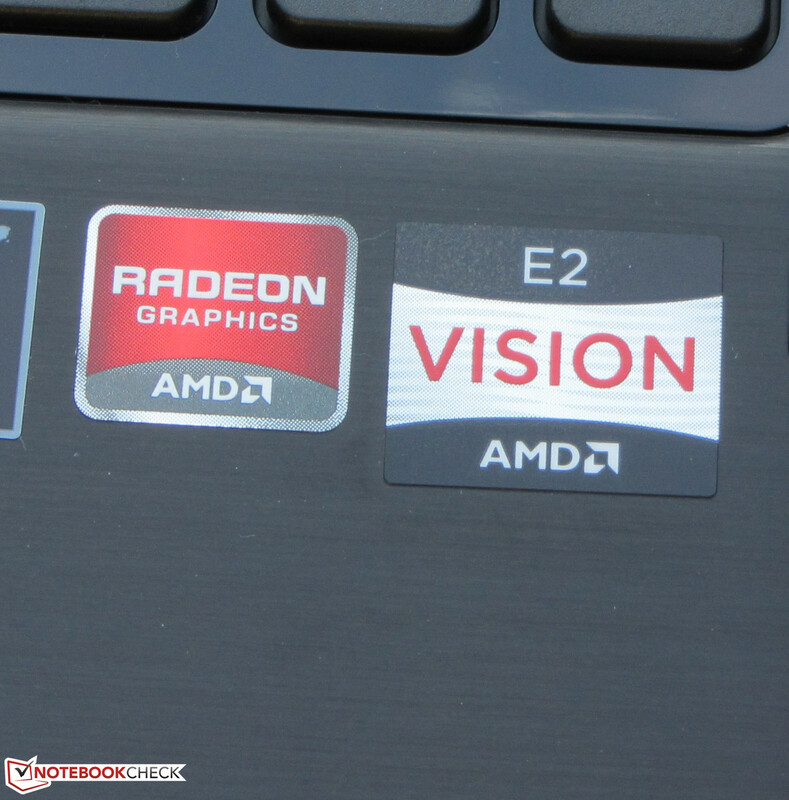 The rates of the 355E5C and B575e (AMD E2-1800, Radeon HD 7340) are virtually identical. Neither contender can defeat the F55A (Pentium B980, HD Graphics). The Pentium processor is superior to AMD's counterparts. Samsung's laptop wins the GL test of Cinebench R11.5. The reason for this is that Samsung has disabled the APU-integrated Radeon HD 7340 GPU and replaced it with the stronger Radeon HD 7470M GPU. The system operates smoothly. However, too much should not be expected. AMD's APU is the bottleneck. For example, the system runs sluggishly when several browser windows are opened at the same time. The PCMark 7 benchmark score is on the expected level. 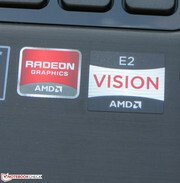 The score of the B575e (AMD E2-1800, Radeon HD 7340) is slightly lower. 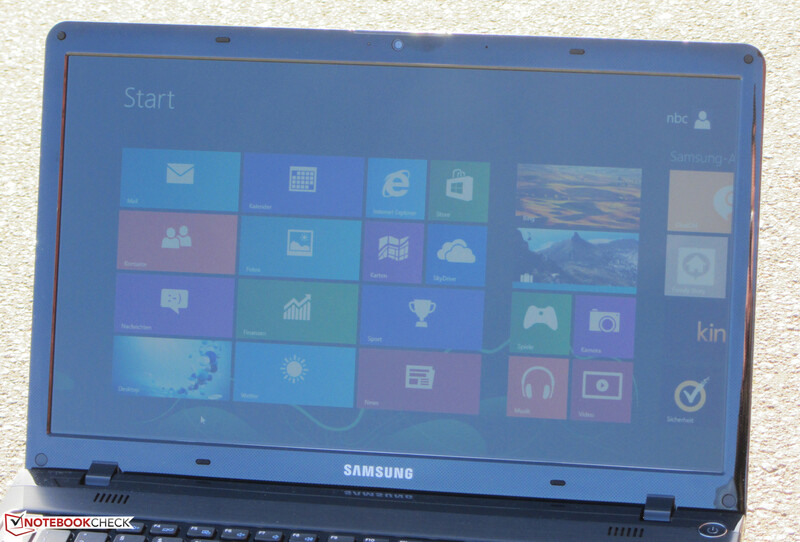 The marginally stronger GPU of Samsung's laptop is noticed here. The score of the F55A (Pentium B980, HD Graphics) is clearly higher than from the contenders. In this case, it is due to the stronger CPU. 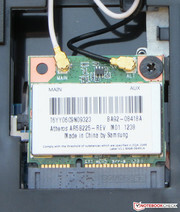 A hard drive from Hitachi's Travelstar 5K750 series is used as the storage device in the 355E5C. The drive runs at 5400 revolutions per minute and has a storage capacity of 750 GB. Thus, it provides plenty of storage capacity for pictures, music or video files. HD Tune ascertained an average transfer rate of 68.1 MB/s. CrystalDiskMark recorded a read speed of 92.36 MB/s. The drive is overall in the midfield of 5400-rpm drives. The APU installed in the 355E5C includes the integrated Radeon HD 7340 GPU. Samsung completely disabled this GPU and treats the laptop to a somewhat stronger, dedicated Radeon HD 7470M GPU. This entry-level graphics core supports DirectX 11 and clocks with up to 800 MHz. 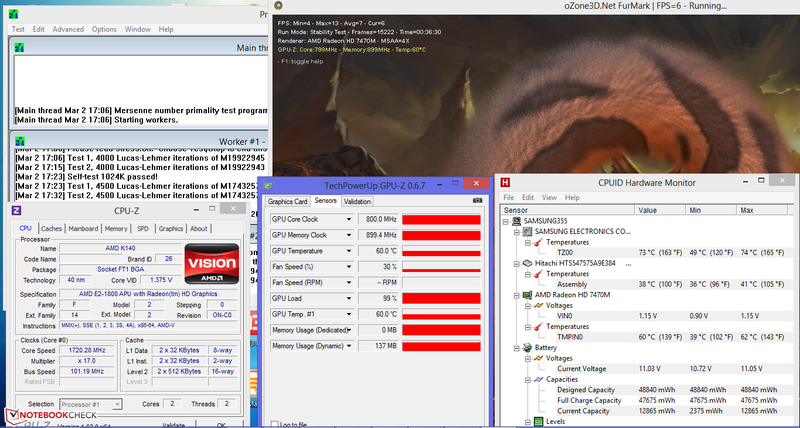 The power of the HD 7470M is roughly on a par with Intel's HD Graphics 4000 GPU in 3DMark 11. The scores in the older 3DMark versions lag behind the HD Graphics 4000 GPU because the CPU was ranked higher in these tests. Both the F55A (Intel Pentium B980, HD Graphics) and the B575e (AMD E2-1800, Radeon HD 7340) lag behind Samsung's laptop in all 3DMark benchmarks. The following comparison graph illustrates the differences between the HD 7340 GPU and HD 7470 GPU. The Radeon HD 7470M GPU would principally be able to render many up-to-date games smoothly in low and often even in medium quality settings. However, AMD's APU is, in the truest sense of the word, a spoilsport. It is too weak for current computer games. Most games stutter even in low resolutions and quality settings. Only Anno 2070 can be played smoothly. The CPU's impact on the frame rates is apparent in a direct comparison with the F55A. Although the 355E5C's GPU is stronger than the F55A's HD Graphics GPU, Asus' laptop usually provides better frame rates. In general: the less CPU power a game needs, the more likely it will run smoothly. Users looking for an affordable, gaming-suitable laptop should look closer at Acer's Aspire E1-571G (Core i3-3110M, GeForce GT 620M) or HP's Pavilion g6-2200sg (Pentium B980, Radeon HD 7670M). Both laptops currently cost about 70 Euros (~$92) – 80 Euros (~$105) more than the 355E5C. The GPU of the initially energy-efficient AMD APU is disabled and the dedicated Radeon GPU clocks with just 100 MHz in idle mode. Nevertheless, we measured a noise of 31.2 to 34.8 dB (A). This is however only reached when Silent Mode is enabled. Both the B575e (30.8 to 33 dB (A)) and the F55A (30.6 dB (A)) work with less noise. With 35.4 dB (A) during medium load (3DMark 06) and 37.5 dB (A) in full load, Samsung's laptop ranges between the B575e (32.2 dB (A) and 36.9 dB (A)) and the F55A (40.1 dB (A) and 42.2 dB (A)). The aforementioned Silent Mode is a special operating mode of the 355E5C. The CPU part of the APU then only clocks with a maximum of 850 MHz. It does not produce as much heat and consequently does not need to be cooled as frequently. Silent Mode can be turned on and off via a function key. The user should keep in mind that the CPU's power is reduced by 50 percent when Silent Mode is enabled. This will be noticed all the more when several program windows and/or website are opened at the same time. 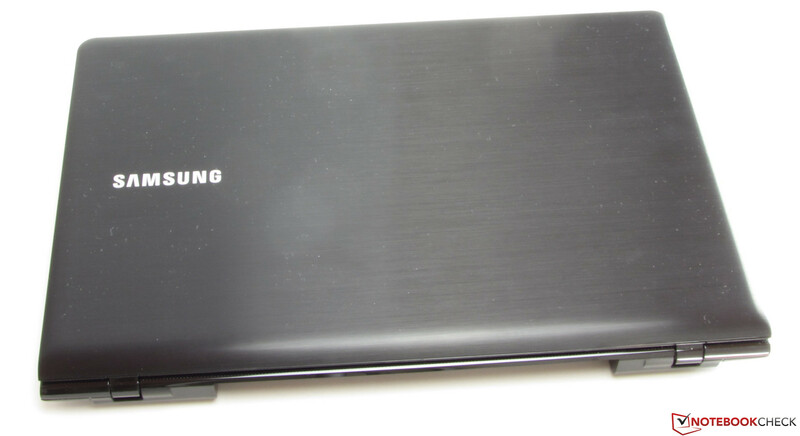 The casing of Samsung's laptop does not heat up exceptionally. We measured temperatures ranging from 23.7 and 33.5 degrees Celsius (~74.7 and 92.3 Fahrenheit) in idle mode. The F55A is on a similar level and the B575e is even a bit cooler. The 355E5C did not break any temperature records with rates between 23.1 and 36.1 degrees Celsius (~73.6 and 97 Fahrenheit) during full load. 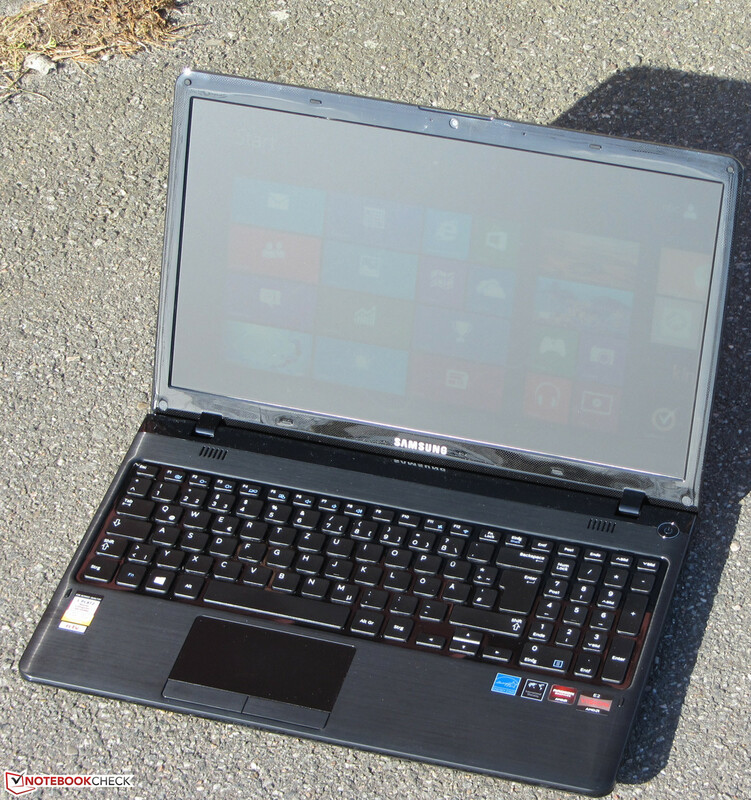 The F55A produces similar temperature rates as Samsung's laptop during full load. Again, the B575e exhibits the lowest temperatures of the two. All three devices can be used on the lap without getting unpleasant. The CPU mostly processed the stress test (Prime95 and FurMark run for at least one hour) at its full speed of 1.7 GHz in AC mode. The core's clock occasionally dropped (700 to 1500 MHz) for a second. The GPU always clocked at its maximum of 800 MHz. On battery power, the CPU ran through the stress test with 1.7 GHz and the GPU clocked with 300 MHz. In order to run the GPU with its maximum clock even during full load in battery mode, the GPU performance has to be set to "Maximize Performance" in AMD's Vision Engine Control center. The CPU's temperature settled to 73 degrees Celsius (~163.4 Fahrenheit) in AC mode. (+) The maximum temperature on the upper side is 33.1 °C / 92 F, compared to the average of 33.9 °C / 93 F, ranging from 21.2 to 62.5 °C for the class Office. 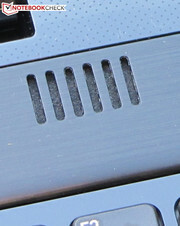 The speakers in the 355E5C are located above the keyboard. They produce low bass but the sound tends to be tinny. Speech is clearly intelligible. The sound can be modified to an extent via the preinstalled SoundAlive software. External speakers or headphones can be connected for a better sound experience. We measured a power consumption of 9.7 to 15.3 Watts in idle mode. These rates are much too high considering the hardware. The B575e is satisfied with 5.9 to 10.5 Watts and the F55A consumes up to 16.2 Watts. The 355E5C places itself between the B575e (23.7 / 29.2 Watts) and the F55A (40.6 / 47.6 Watts) with 35.2 Watts in medium load (3DMark 06) and 43.9 Watts during full load (Prime95 and FurMark). The 355E5C achieved a runtime of 6:07h while idling. It is on a par with Asus' laptop (6:15h) but clearly behind the B575e (10:49h). 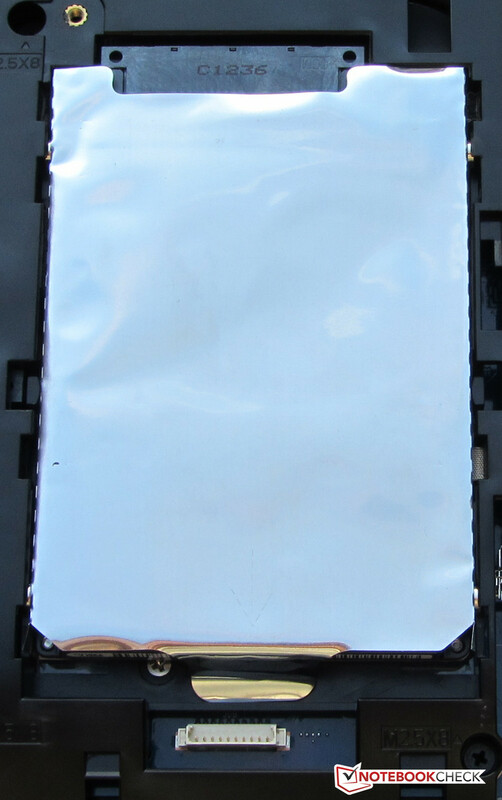 The idle runtime is ascertained using Battery Eaters Reader's test. The screen is set to minimum brightness, the energy-savings profile is enabled and the wireless modules are disabled. The battery in Samsung's laptop lasted for 2:47h in load. Neither contender achieved this rate: F55A: 1:11h; B575e: 2:08h). The load runtime is determined using Battery Eater's Classic test. The screen is set to maximum brightness and the high-performance profile and wireless modules are enabled. The 355E5C finished the Wi-Fi test with 3:51h. Asus' laptop (4:12h) and the B575e (4:28h) lasted longer. Websites are automatically opened every 40 seconds in this test. The energy-savings profile is enabled and the screen's brightness is set to approximately 150 cd/m². Samsung's 15.6-incher achieved a DVD playback time of 3:24h with one battery charge. Again, the contenders from Asus and Lenovo ran a bit longer with 3:47h. The DVD test is performed with enabled energy saving mode (or a higher profile should the DVD not run smoothly), maximum screen brightness and disabled wireless modules. 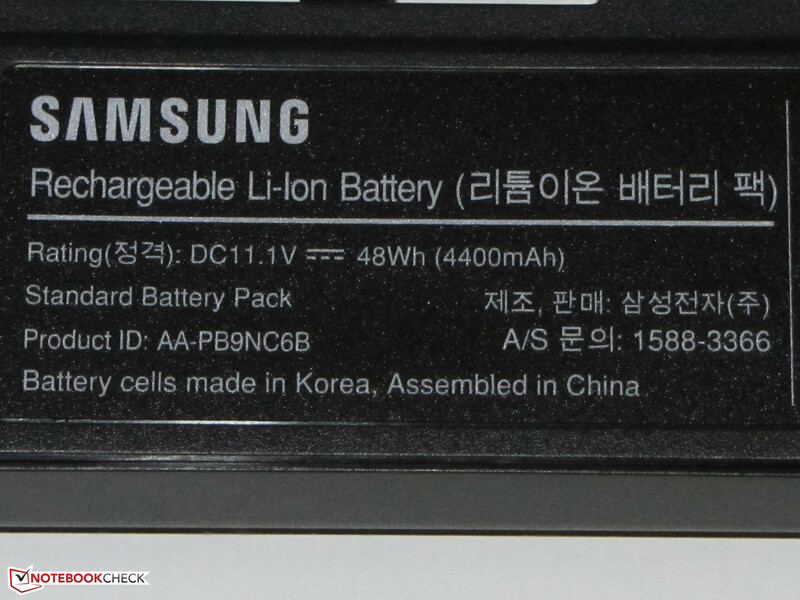 The runtime of the three devices can be compared well since their batteries have a similar capacity (Samsung, Lenovo: 48 Wh; Asus: 47 Wh). Samsung's 355E5C leaves us with mixed feelings. The two-year warranty, spacious hard drive, low temperature development, satisfactory keyboard and matte screen were positive aspects. However, Samsung does not manage to exploit the positive qualities of AMD's APU, namely the low power consumption. A laptop that sports an E2-1800 APU should achieve longer battery runtimes, particularly in idle mode. The 355E5C does not improve on the runtimes of Asus' F55A while delivering less CPU computing power. The equally affordable Dell Vostro 2520 achieves even longer runtimes (idle: 8:27h; Wi-Fi: 5:24h, DVD playback: 5:10h) and features a Core i3 processor. Using the Radeon HD 7470M GPU does not make much sense either. The bit more 3D power compared with the APU-integrated GPU is not noticed in practice. The dedicated GPU does not make the 355E5C into a gaming-suitable laptop. Lenovo's B575e is interesting for all users who want a laptop with a matte screen and a good keyboard. Asus' F55A comes into question when as much CPU power as possible is wanted. The F55A also only costs 299 Euros (~$391) without a Windows operating system. All drivers and programs can be reinstalled after resetting the system to factory settings via the SW Update tool. and provides a maximum of 60 Watts. The hard drive can be replaced easily. 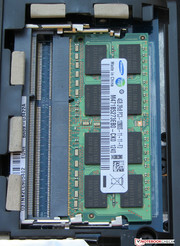 The laptop sports two working memory banks. The GPU can clock with full speed even on battery power. The screen provides acceptable rates for the laptop's price range. The 24-month warranty is also pleasing. Better battery runtimes, better application performance and lower operating noise at idle. Samsung fuses the E2-1800 APU with a dedicated GPU. That's unusual.